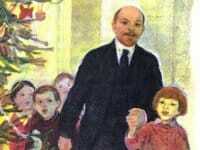 I have been giving talks to groups for many years now and have enjoyed travelling all over the UK to do so. 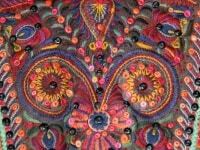 My usual audiences are members of organisations such as the Embroiderers’ Guild, Quilters’ Guild, Costume Society, Women’s Institute and art history groups. 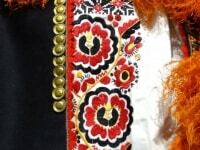 I am happy to put together a talk to appeal to any kind of audience, and to discuss your requirements. 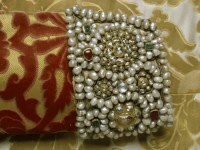 Please go to the Contact page and get in touch! 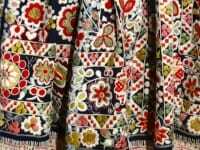 Any of the talks listed can be adapted to suit embroiderers, quilters, those principally interested in dress, art history, travel or a more general audience. 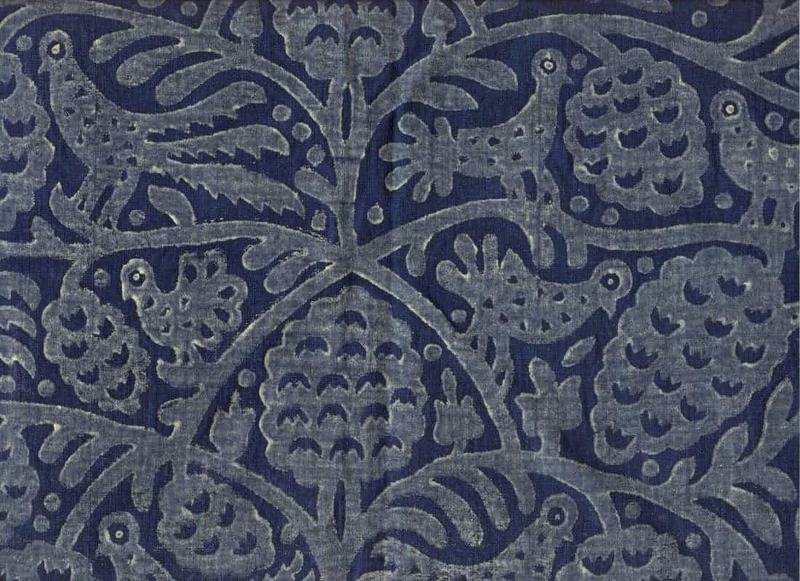 Study days combining talks with hands-on examination of my own textile collection, and discussion of pieces brought in by audience members can be arranged. 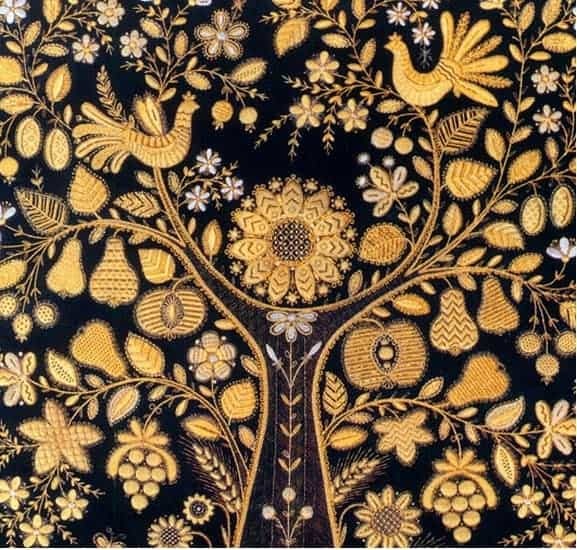 Feathers of the Firebird – Textiles from Russia – gives a taste of the many aspects of Russian embroidered and printed textiles, and shows how they relate to Russia’s rich tradition of decorative arts. 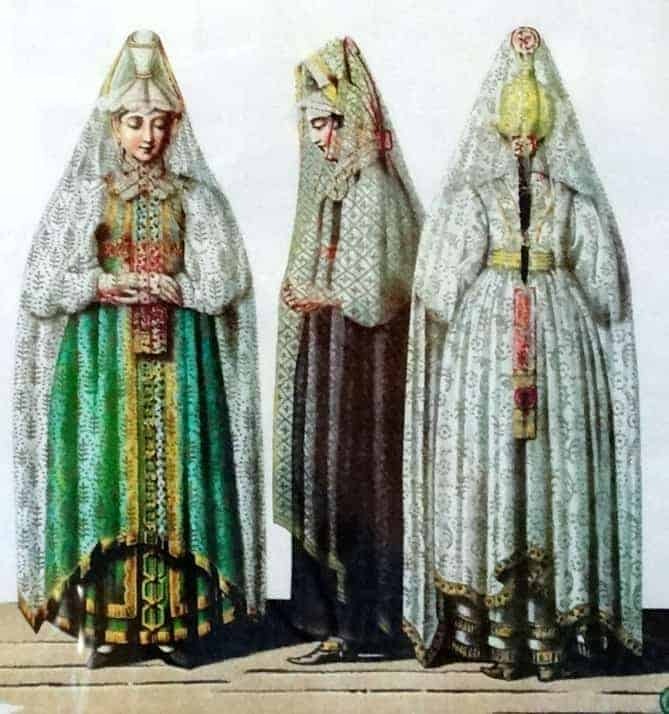 We will look at peasant embroideries and dress, embroidered icons from the Russian Orthodox tradition and vibrant textiles from contemporary Russian artists. 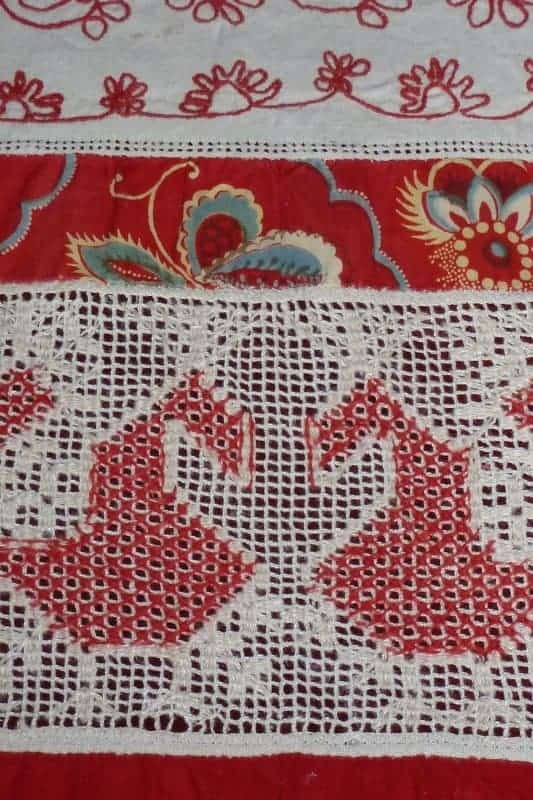 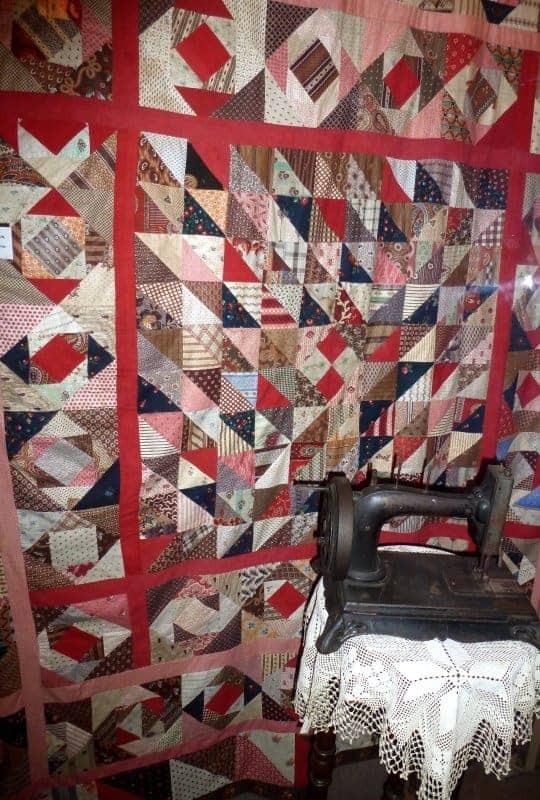 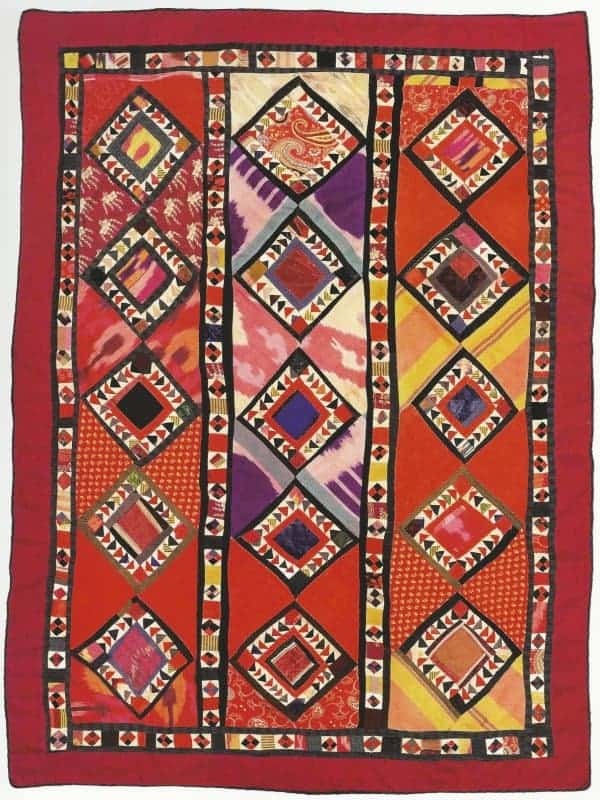 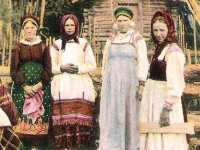 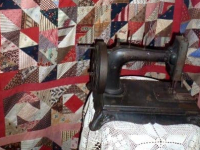 Russian Patchwork & Quilting – Ancient & Modern – in Russian peasant life patchwork and quilting were economical ways of creating decorative textiles for home and dress. 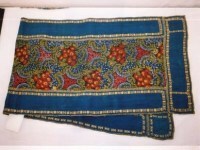 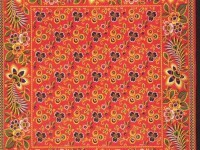 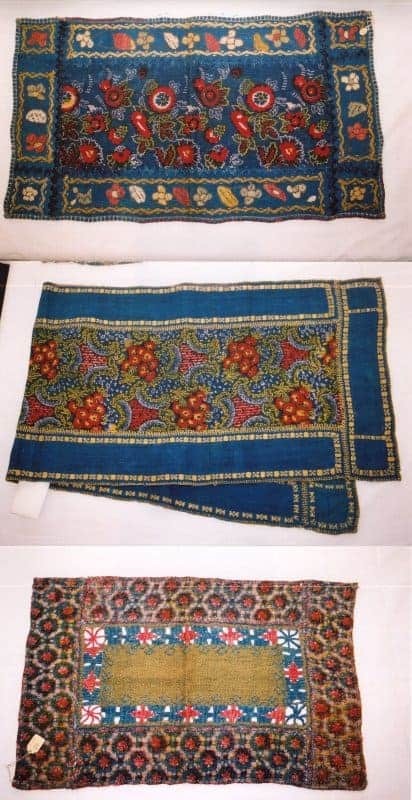 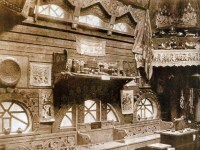 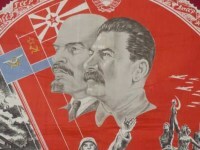 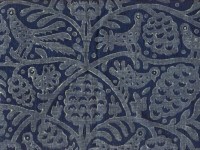 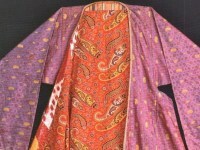 The printed cotton fabrics that were typically used were a famous Russian product, both before and after the Revolution. 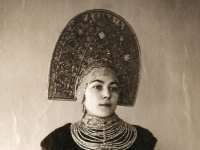 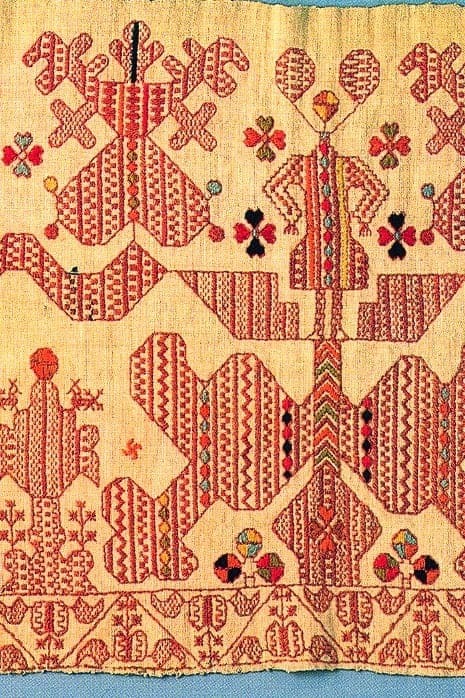 Contemporary Russian textile artists have enthusiastically embraced traditional materials and techniques to produce exciting new work. 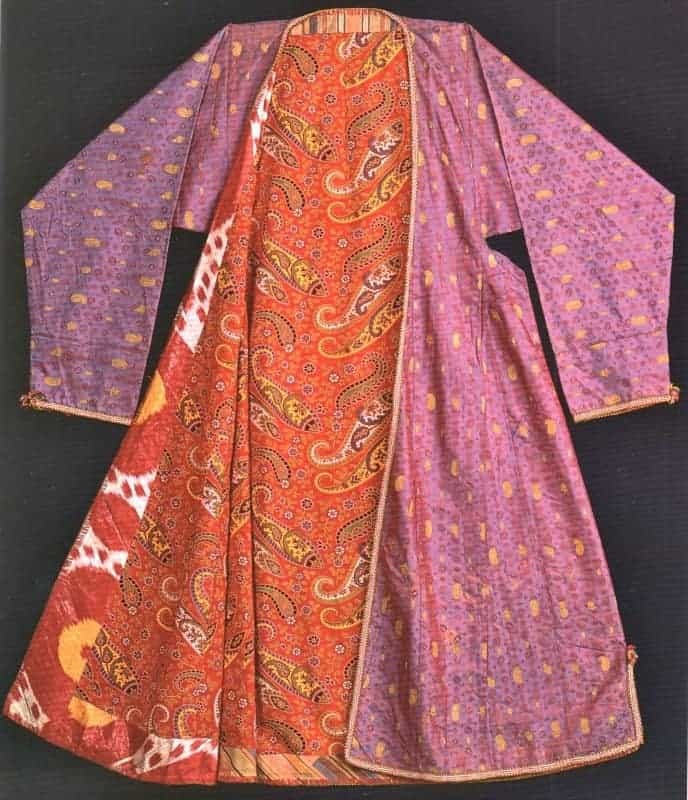 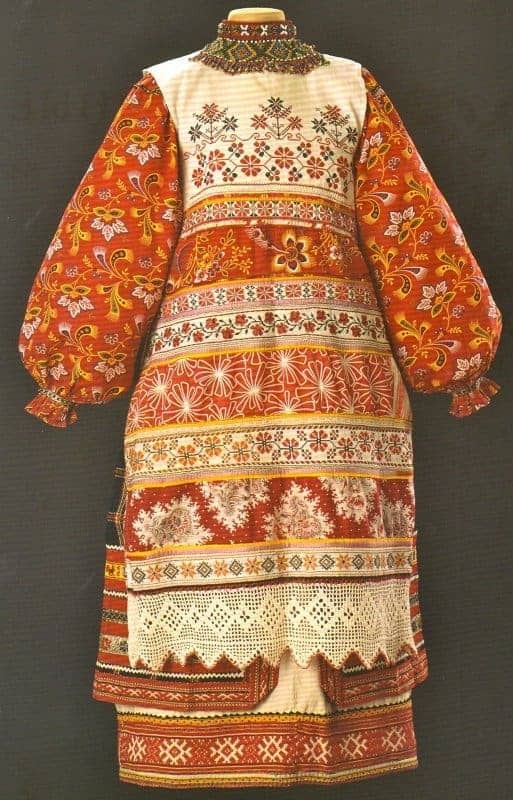 Marvellous Materials from Russia – In the 18th and 19th centuries Russia’s textile manufacturers produced sumptuous woven silk brocade and velvet for display at court and in aristocratic circles as well as vibrant cotton prints and bleached linen for peasant dress and domestic textiles. 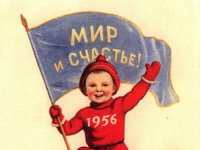 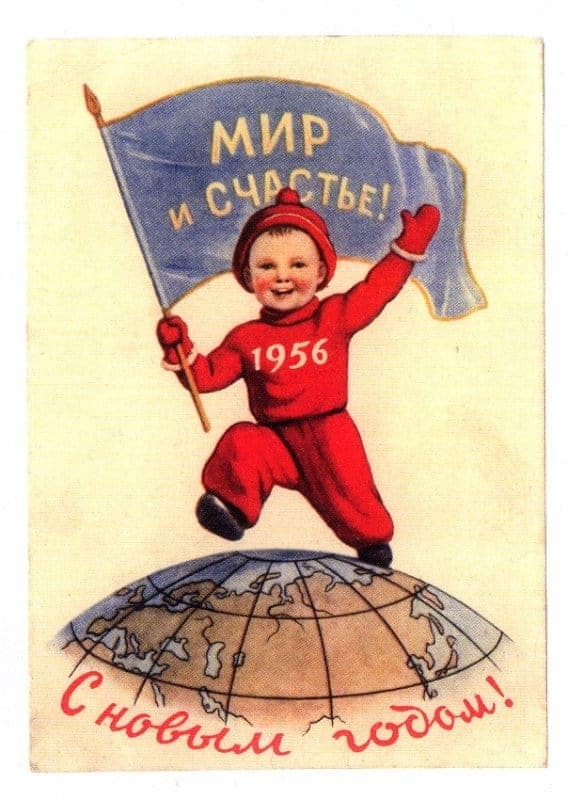 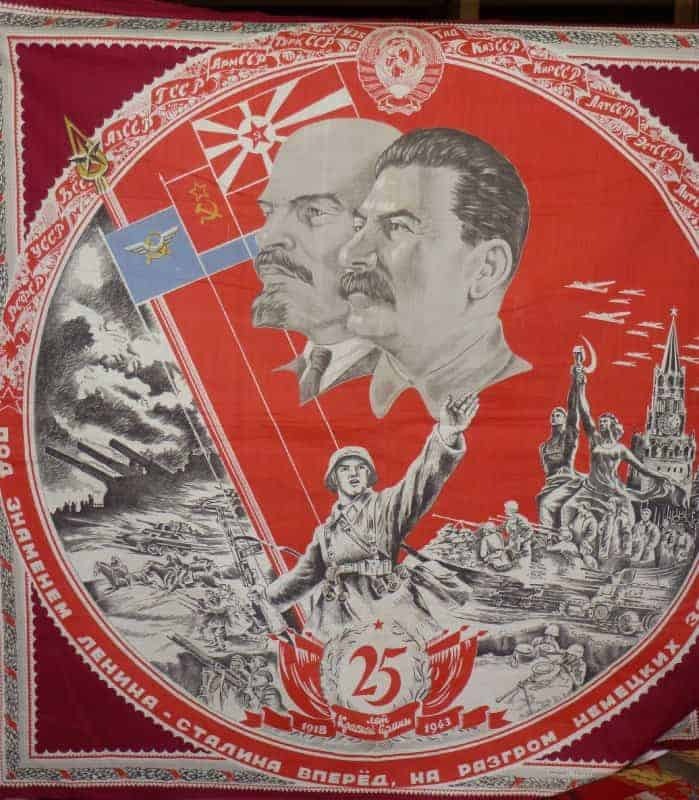 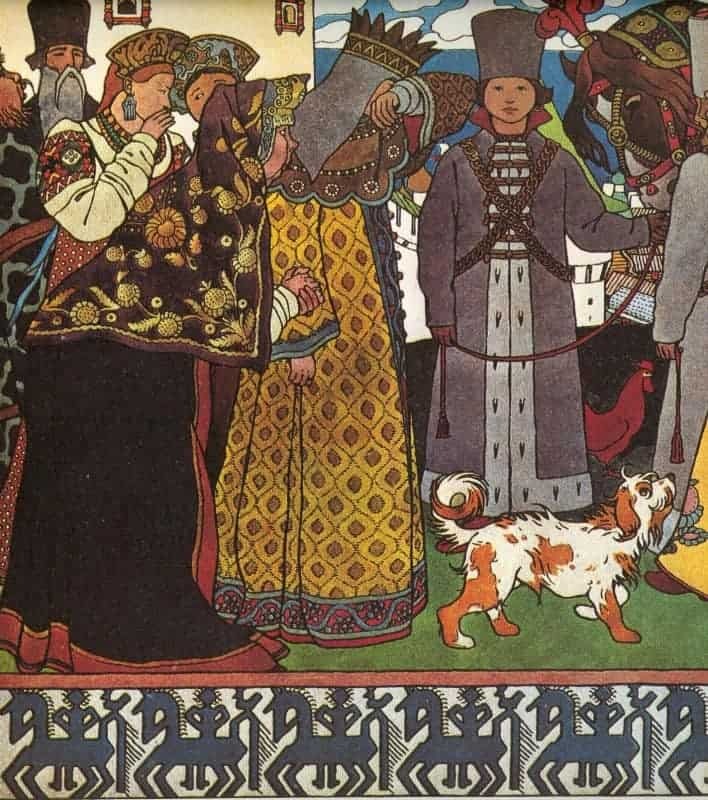 Fascinating designs also emerged from the Soviet era. 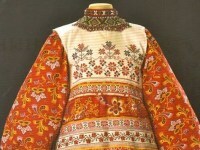 We’ll look at the historic and contemporary use of Russian fabrics, and the creative work they have inspired. 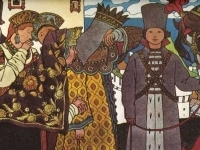 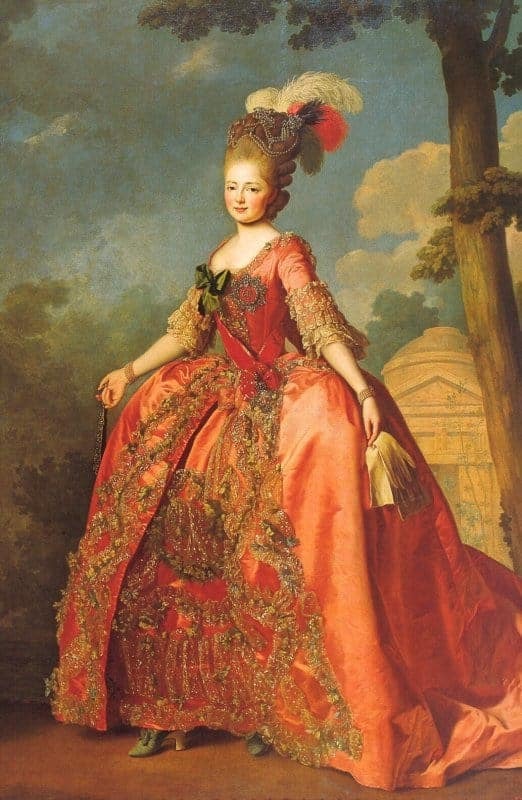 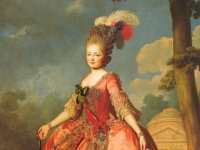 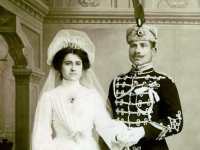 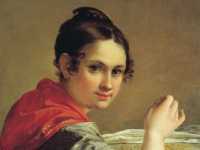 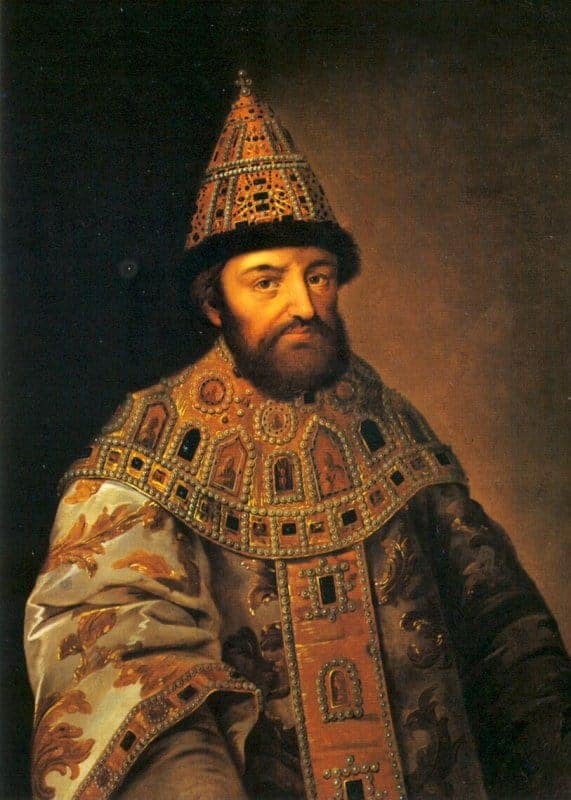 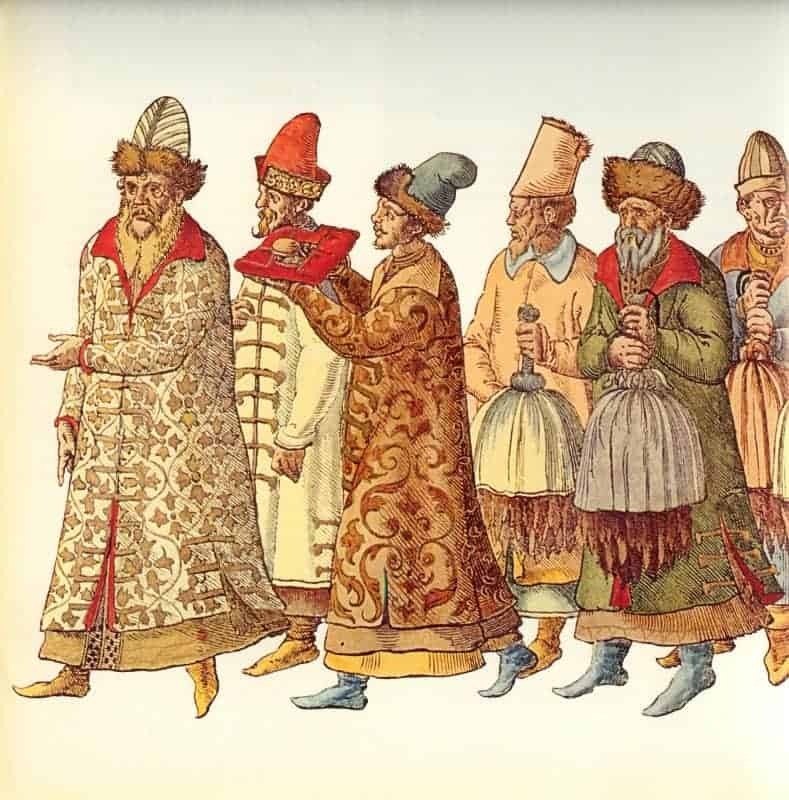 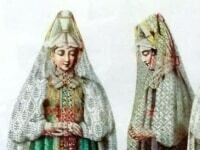 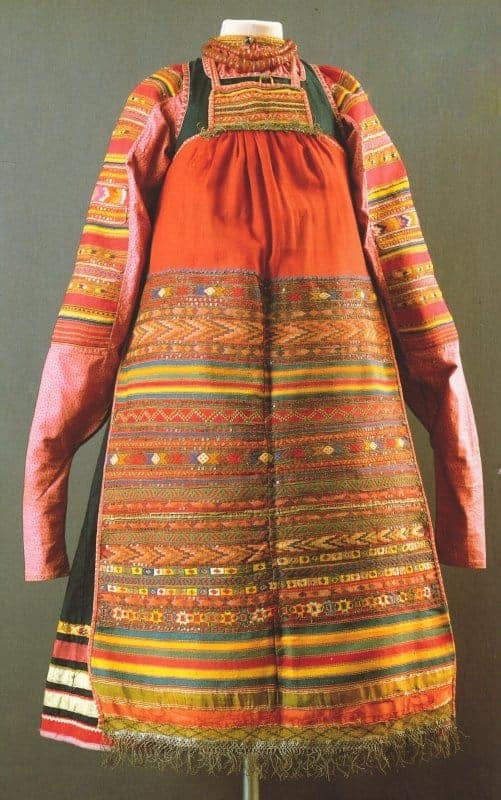 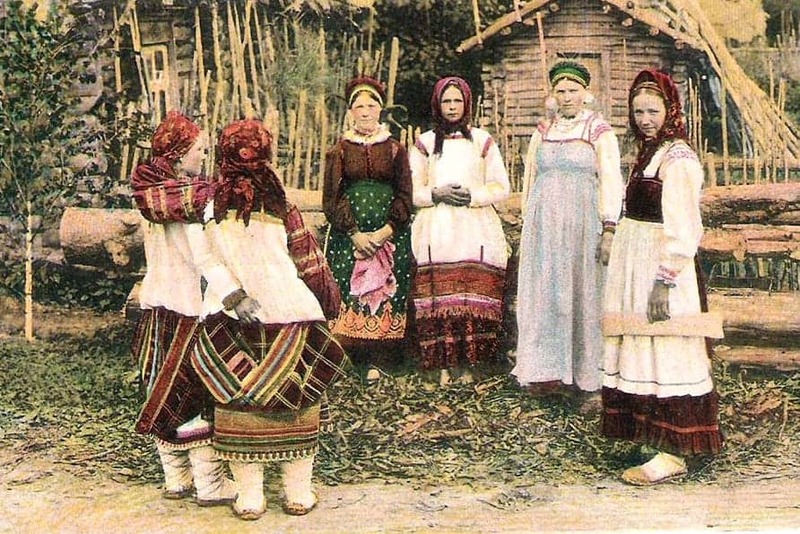 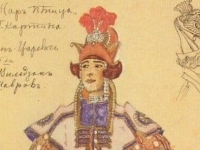 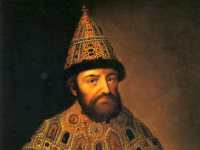 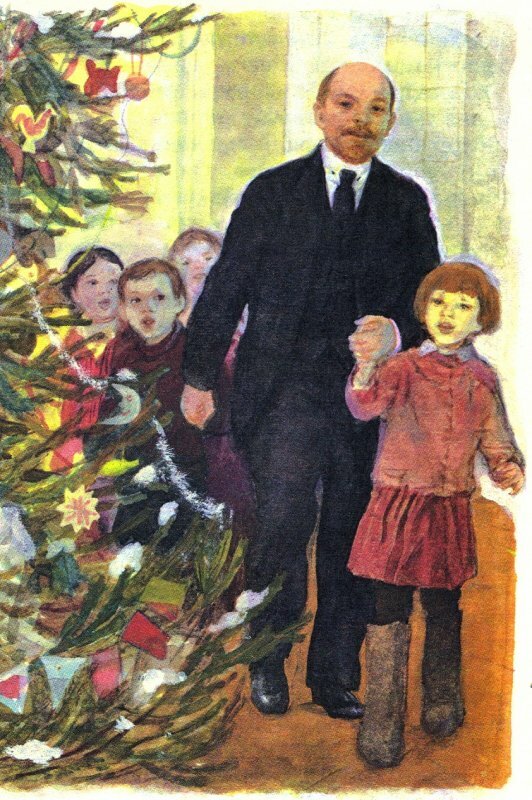 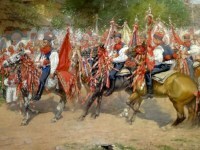 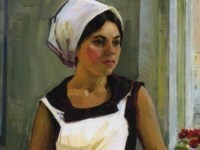 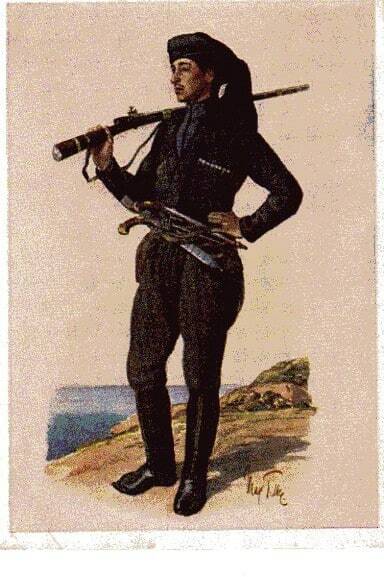 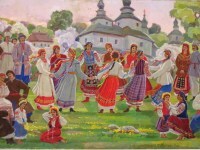 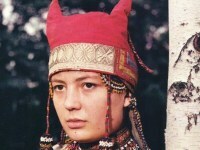 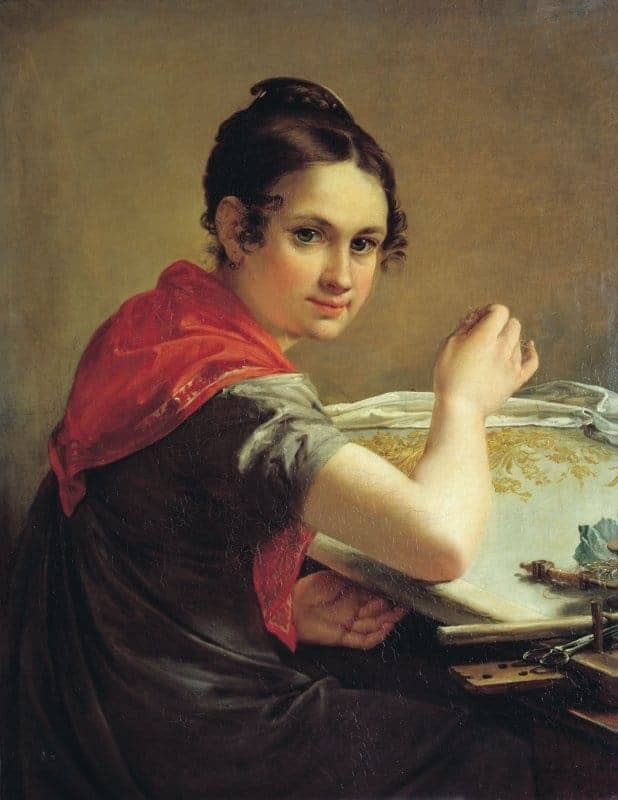 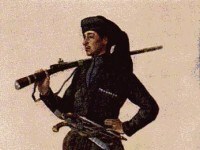 Following the Red Thread: a History of Russia through Dress – describes medieval Boyar dress, Peter the Great’s dress reforms, aristocratic and Court dress, peasant everyday and festive dress, the transition to 20th century urban dress – and ‘the picturesque peasant’– inspiration for nationalist and socialist art and design. 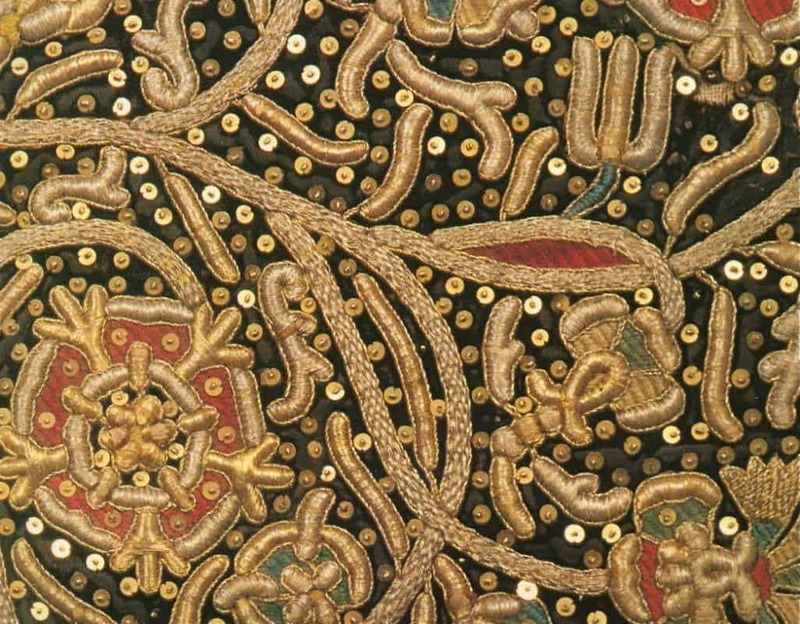 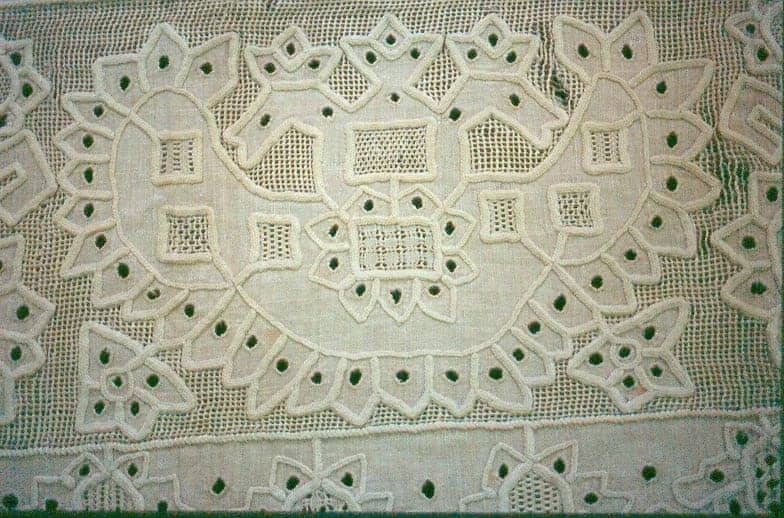 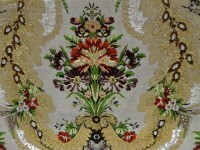 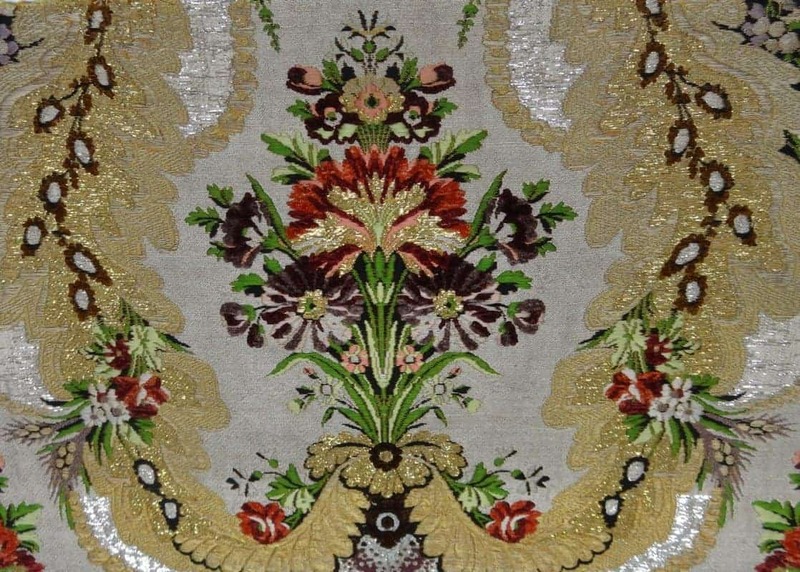 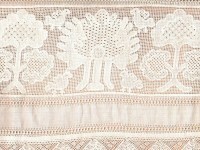 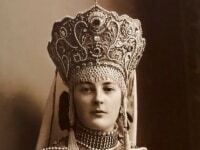 Metal-thread Embroidery in Russia – the use of gold and silver thread has been a feature of embroidery in Russia for many centuries, seen on ecclesiastical textiles from the 12th century, on elaborately embellished headdresses, shawls and waistcoats of peasant festive dress, and on luxurious robes worn at court, until the 1917 Revolution did away with such extravagance. 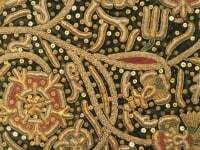 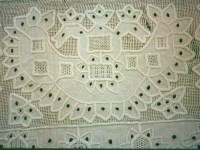 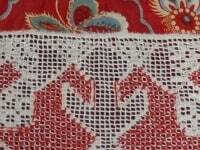 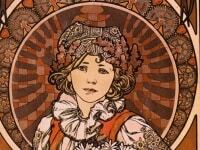 We will also look at gold-thread embroidery being produced today in the small town of Torzhok. 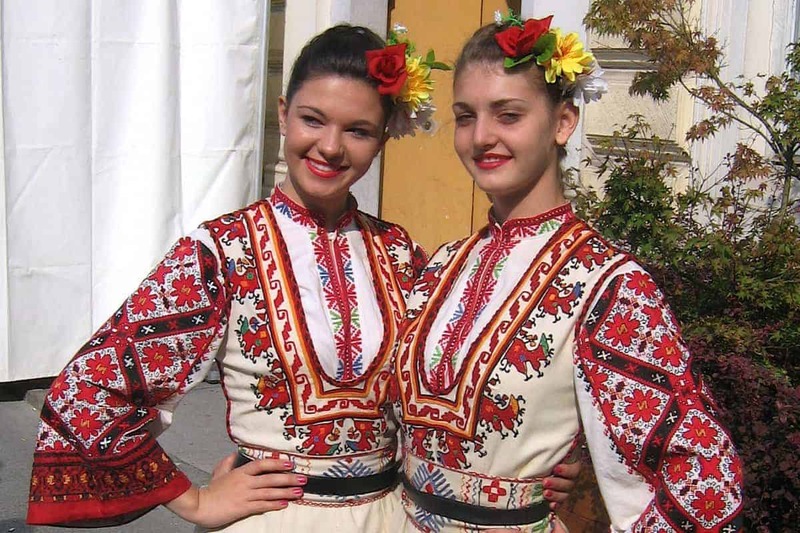 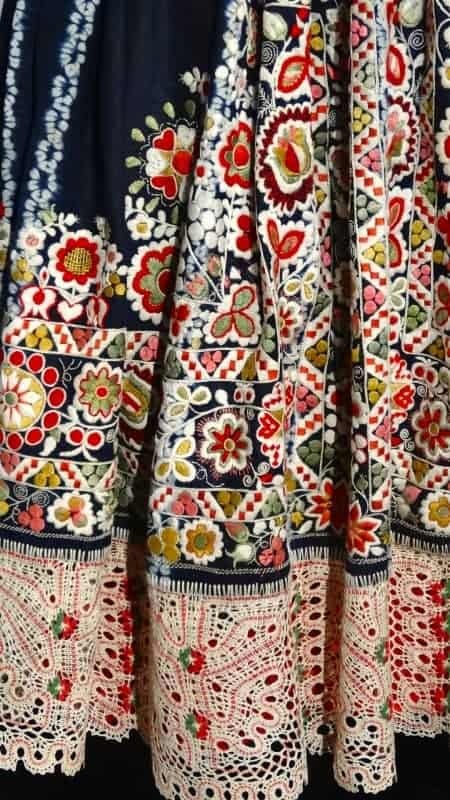 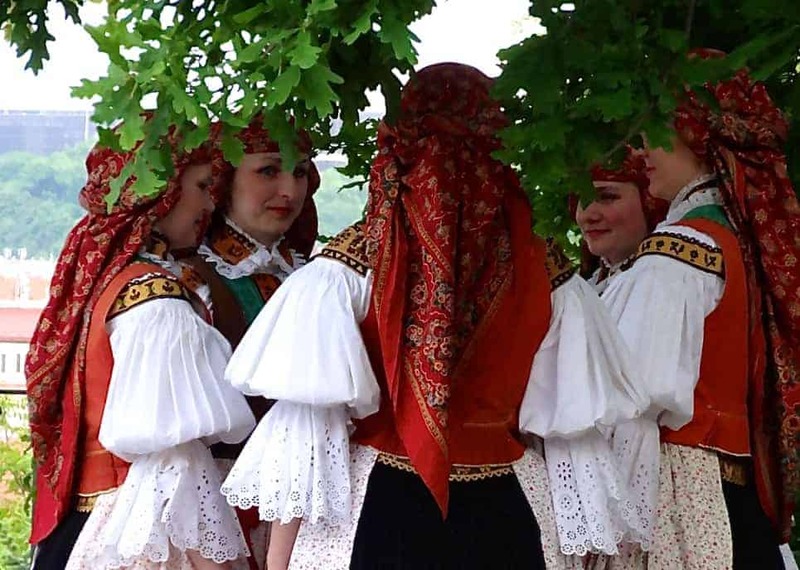 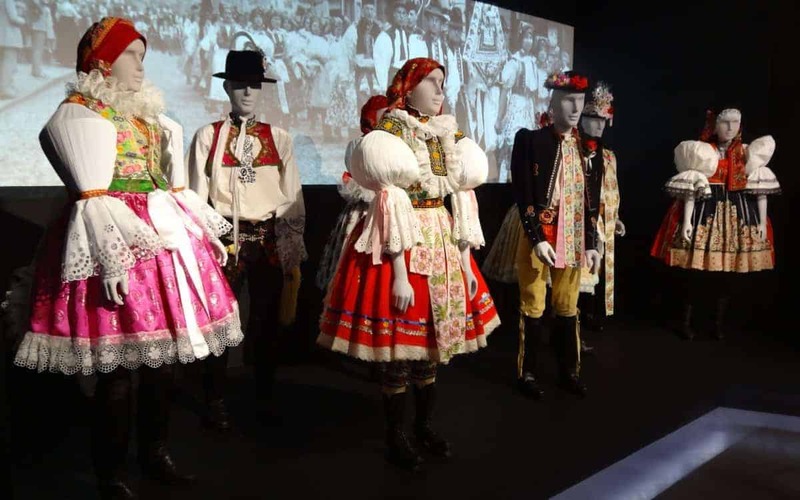 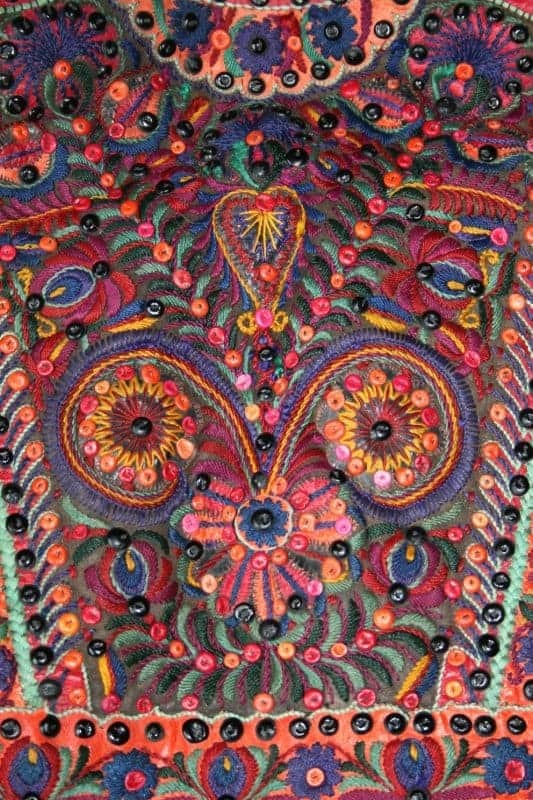 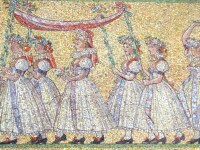 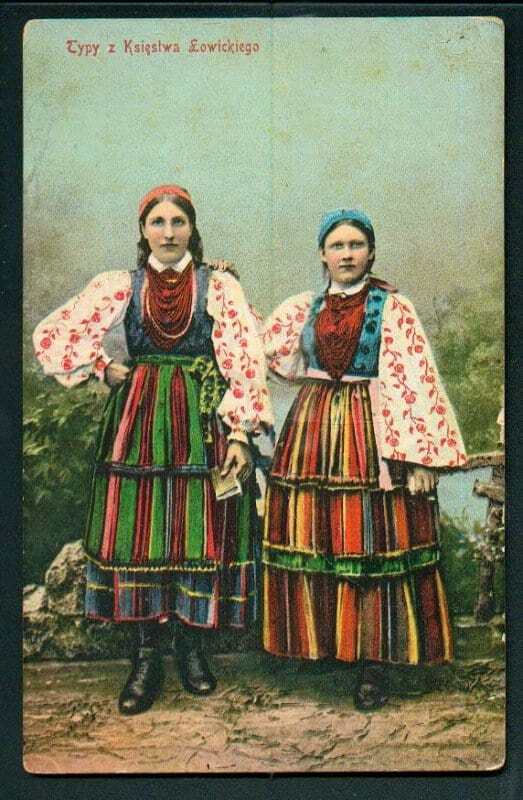 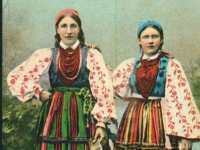 Folk embroideries, textiles and dress from the Czech Republic – a colourful tour, including a look at some Czech artists who depicted the people and their customs. 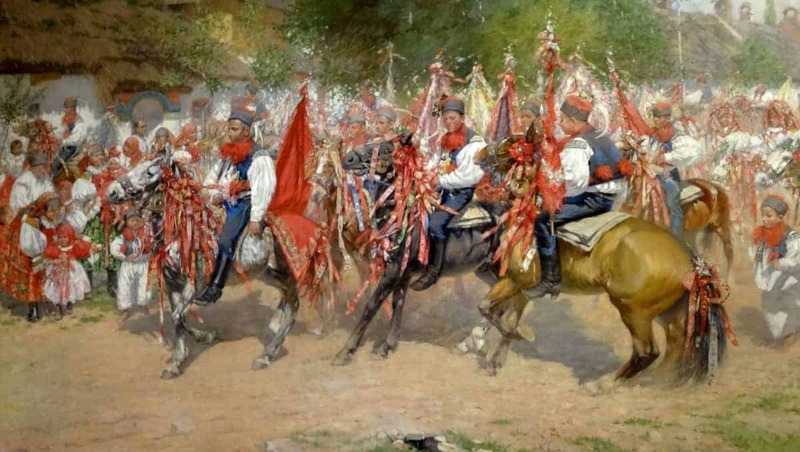 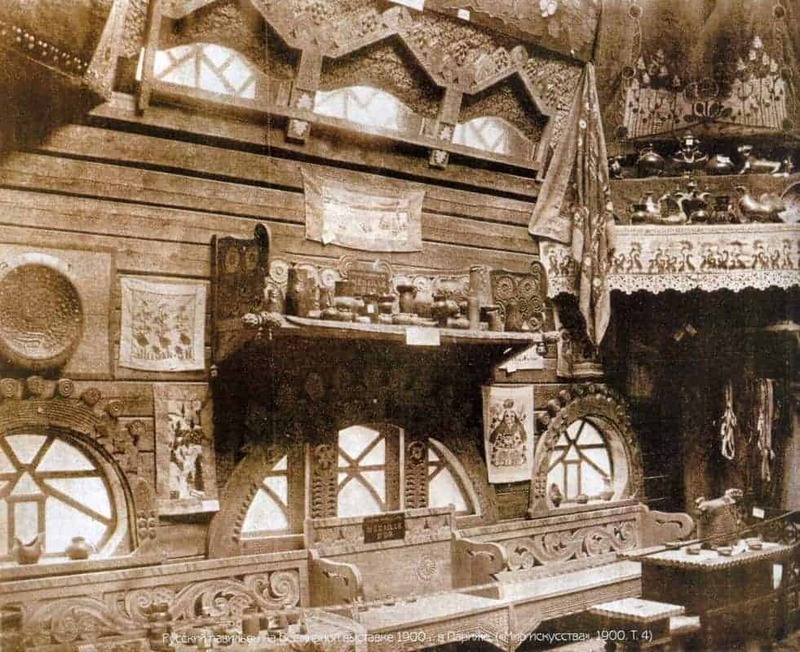 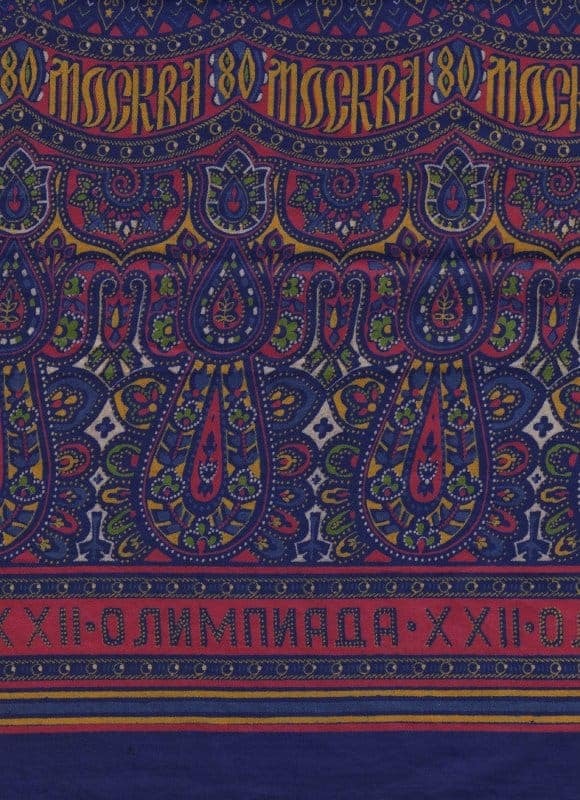 Ivanovo – the ‘Russian Manchester’, and the story of printed textiles in Russia – Before the 1917 Revolution Russia had a thriving textile industry, exporting vast quantities of printed cotton throughout the Russian empire and beyond. 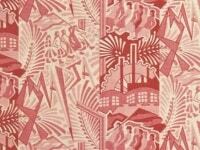 In the city of Ivanovo alone nearly 30,000 textile workers were employed. 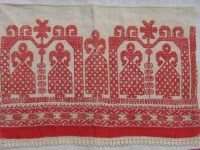 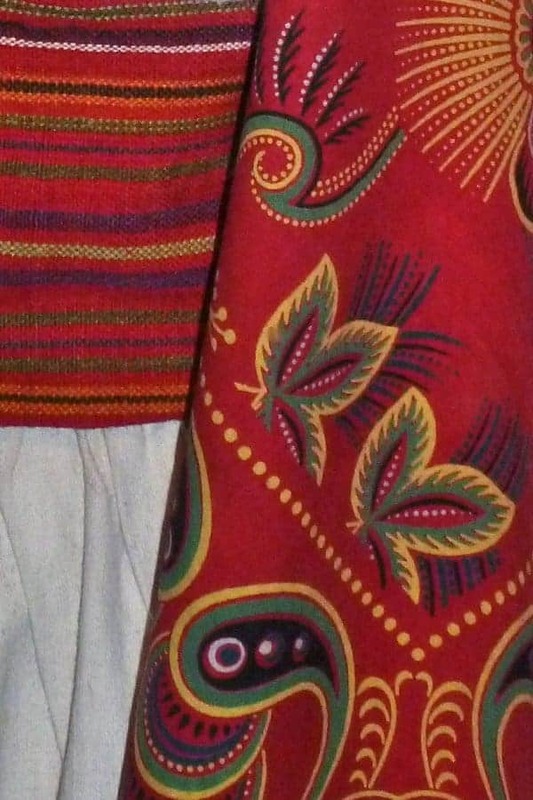 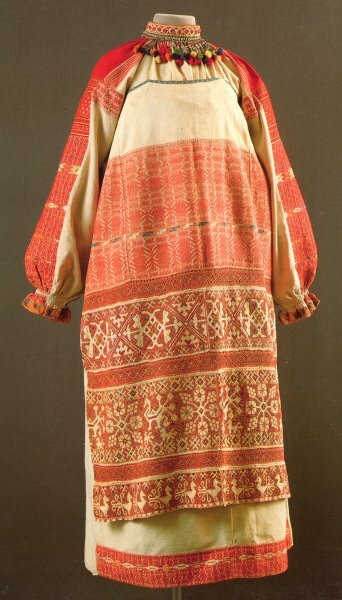 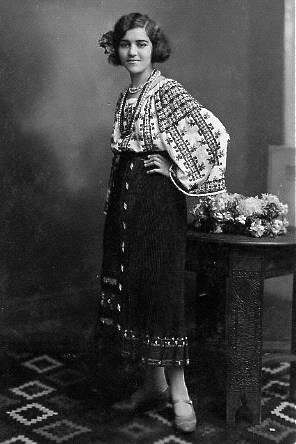 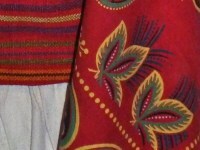 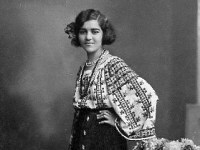 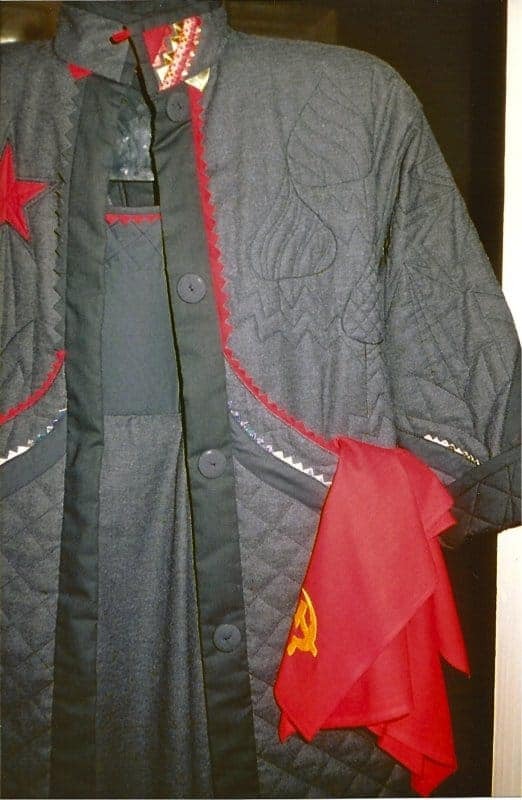 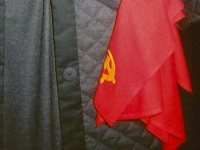 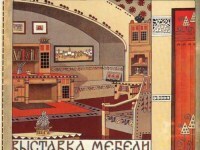 Distinctive red prints became an important element of folk dress, and in the 1920s and ’30s designs promoted the philosophy of the new Soviet state. 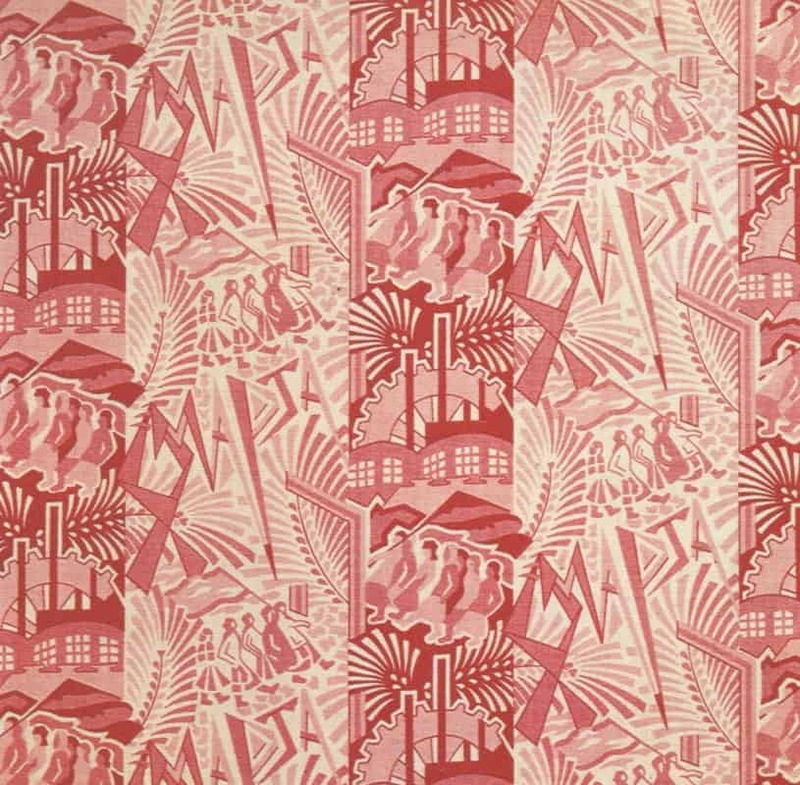 This talk explores the colourful and sometimes dramatic history of the industry. 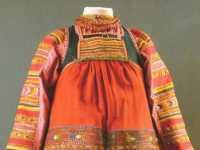 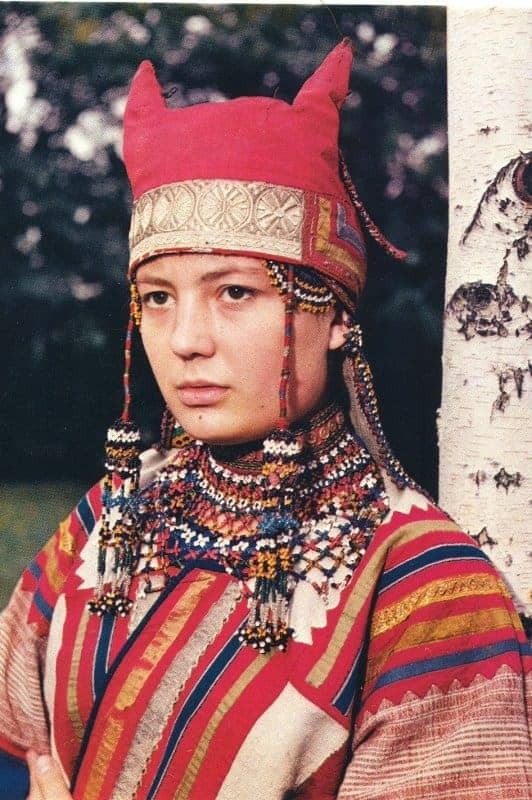 Embroidery and dress in Central and East European peasant life – looks at the colourful textiles of this part of Europe, their function and meaning within the rural way of life that had all but disappeared by the mid 20th-century. 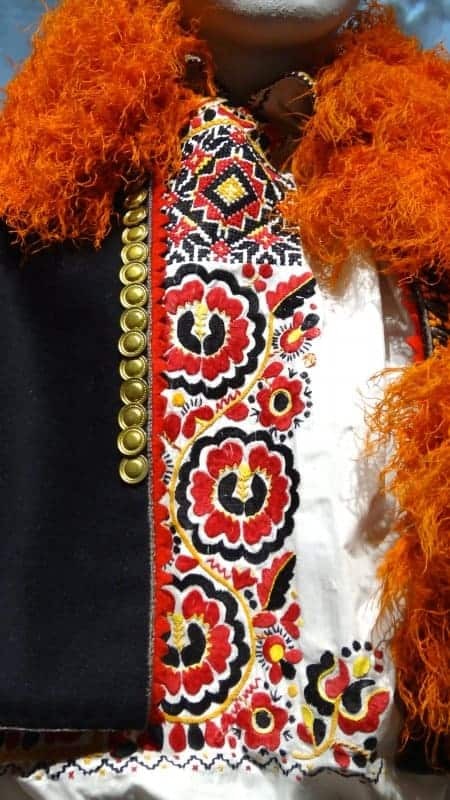 We will look particularly at textiles from Ukraine, Poland, Romania and the Czech Republic, and will also consider how some skills and traditions are being revived today. 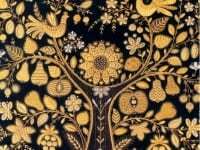 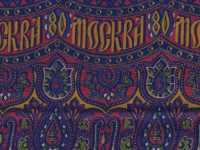 Textiles of the Russian Arts & Crafts Movement – tells of the vibrant period around the turn of the 19th and 20th centuries when many European countries, including Russia, ‘discovered’ their nation’s past. 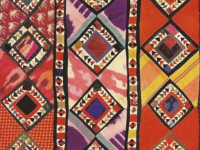 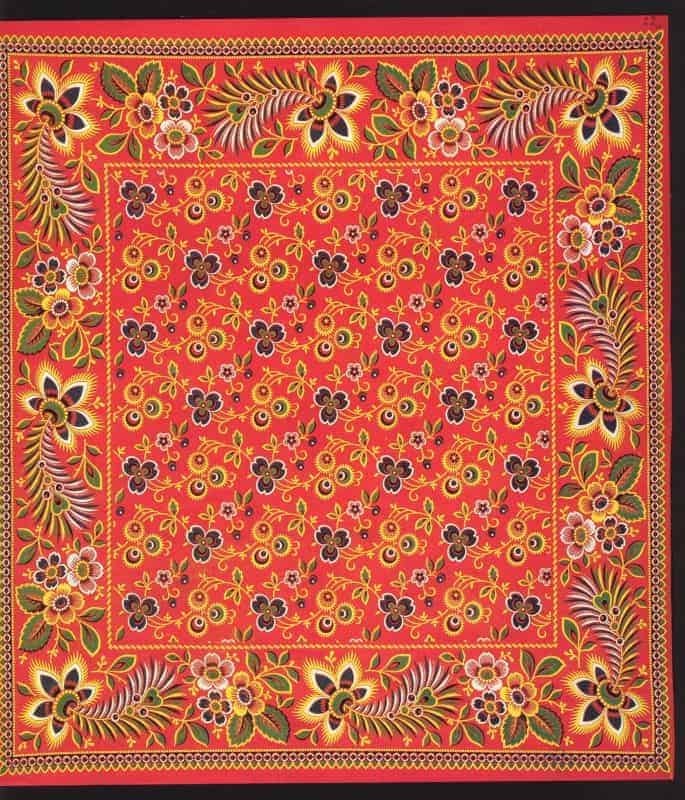 Artists and philanthropists collected and promoted traditional peasant arts, training village artisans to create new work, including wonderful decorative textiles, for sale at home and abroad. 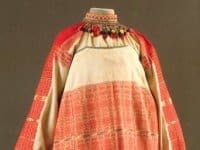 How some of these pieces made their way to Britain and the way people reacted to them and their exotic culture of origin makes a fascinating story. 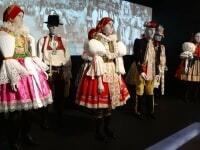 Freedom Fighters, Folk Revival and Fashionistas: the role of costume in the quest for national identity in Eastern Europe – investigates how regional and national dress played an important part in the movements taking place in many of the central and east European and Balkan countries in the 19th and 20th centuries, through which they strove to establish their own national identities, especially as the great powers – Russian, Austro-Hungarian, Ottoman, and finally Soviet – were disintegrating. 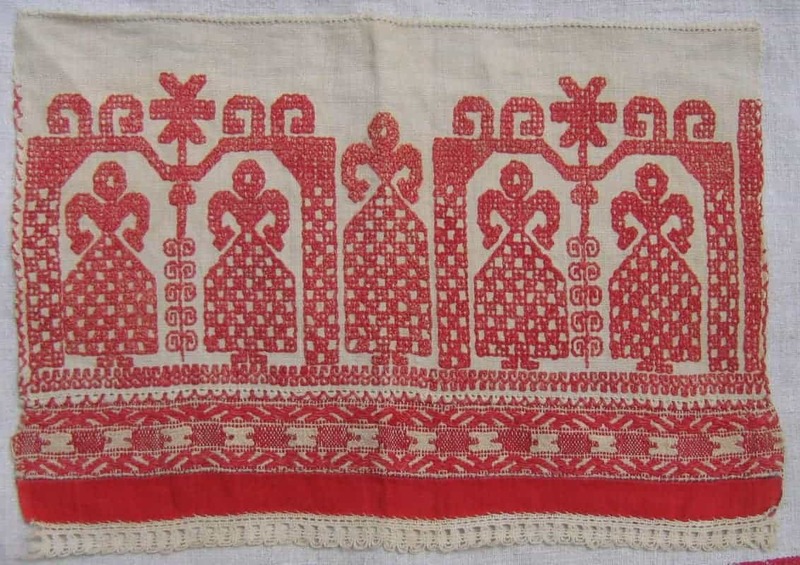 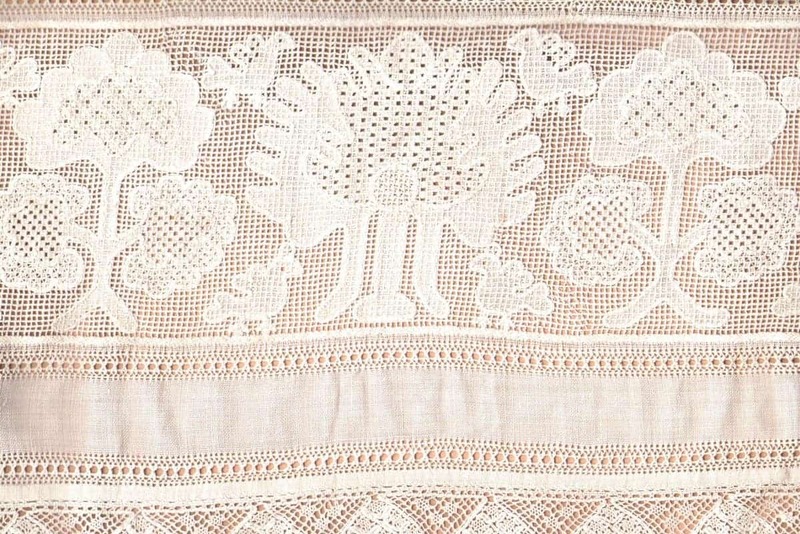 Russian Christmas – contains elements of the more general ‘Textiles from Russia’ talk, but brings in images and inspiration taken from the Christian and pre-Christian myths and motifs associated with the Christmas season – and which are in evidence in both traditional and contemporary Russian embroidery. 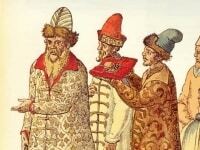 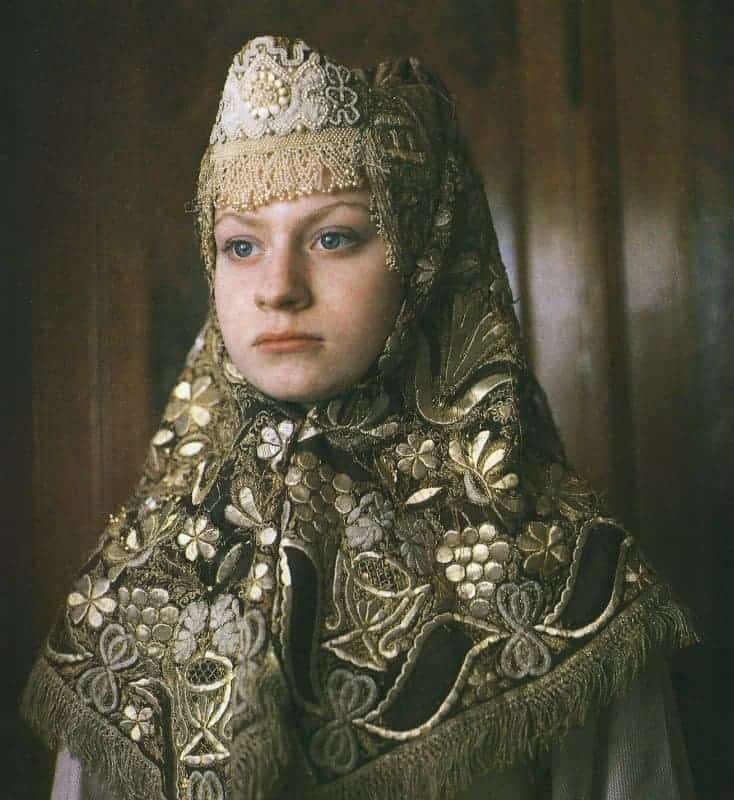 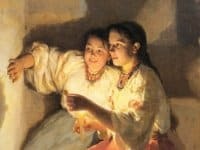 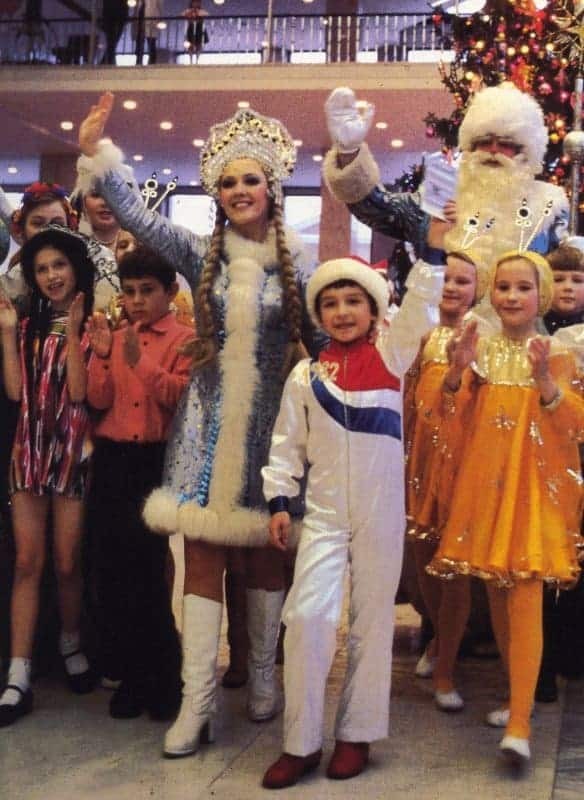 ‘Christmas in old Russia was a mixture of European customs and ancient Russian traditions, of Christianity and superstition, and of holy nights and strange spirits.’ We will look at the ways in which both pagan and Christian beliefs associated with the winter have been celebrated in Russia through textiles. 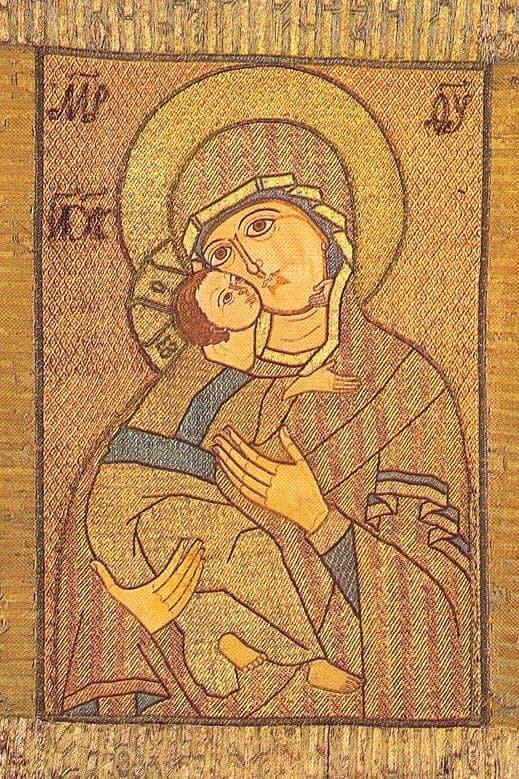 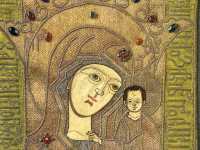 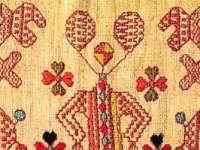 Maidens & Mothers – pre-Christian and Christian myths and motifs in Russian embroidery – covers Russian textile art, including dress, which expresses both folk and religious belief. 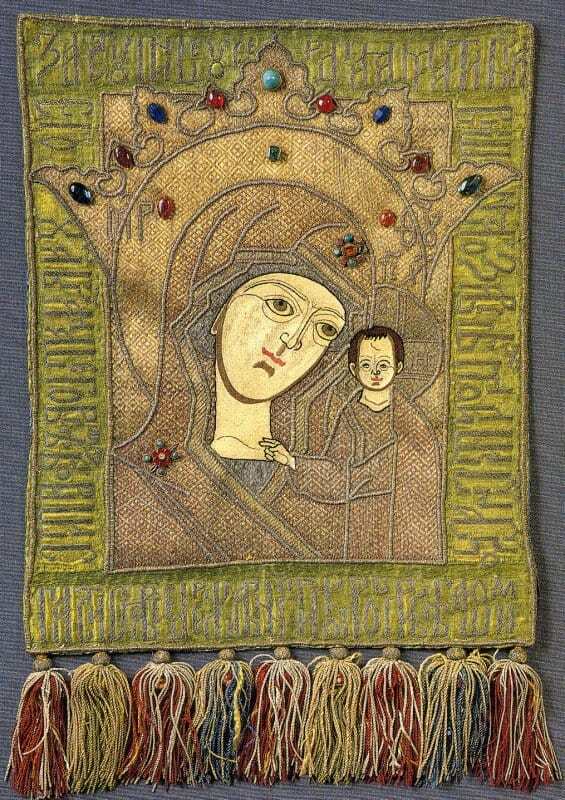 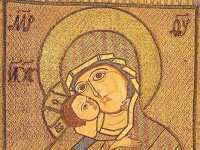 For hundreds of years Russian embroiderers have devoted their skills to celebrating both pagan goddesses and Christian saints. 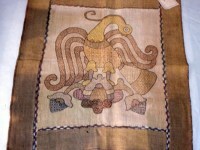 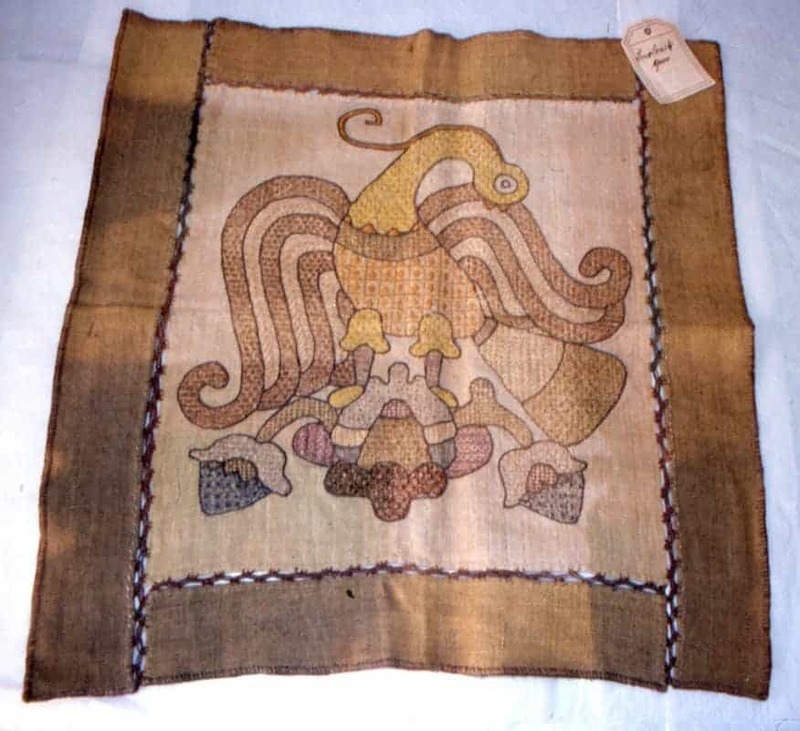 Mokosh the earth goddess, embroidered on linen in every peasant girl’s collection of cloths for her dowry or as a talisman on her dress, and the Virgin of Vladimir, worked in rich gold thread on damask cloth in the monastery workshops, are both powerful images associated with Russia’s textile heritage. 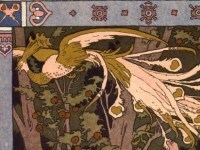 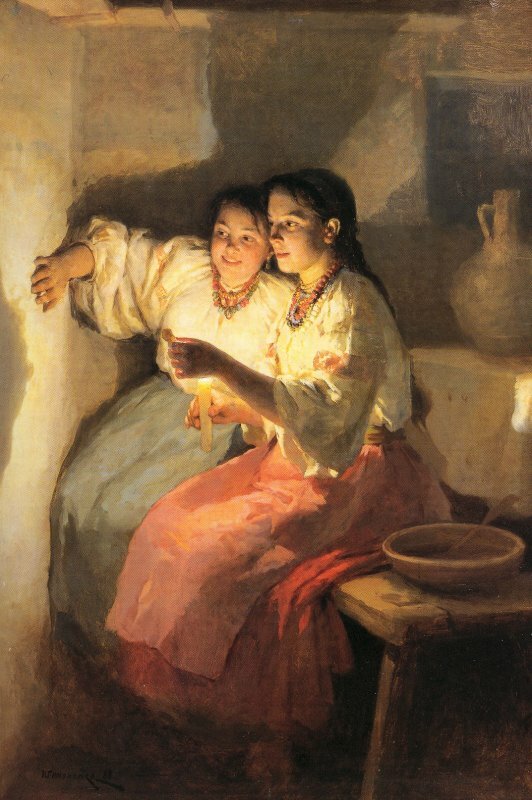 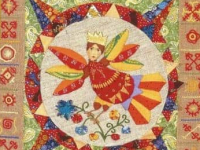 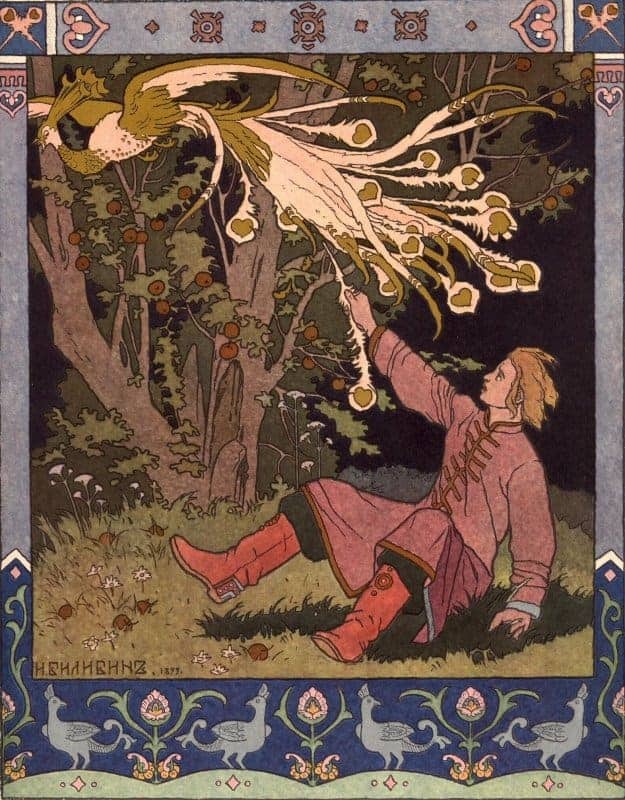 The talk also touches on Russian folk tales, such as Vassilisa the Beautiful, and the story of the Firebird and their textile connections. 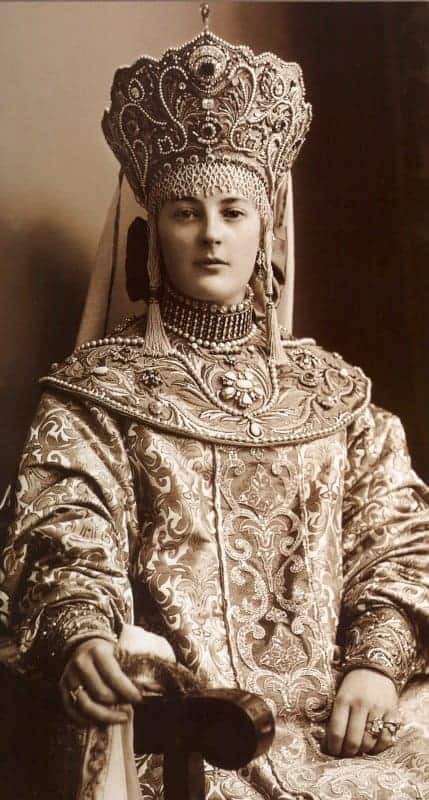 Russian Royal Dress – very different in style before and after Peter the Great’s reforms of 1700, dress worn at the Russian court was always sumptuous, dripping with jewels, and encrusted with embroidery in silk and metal thread. 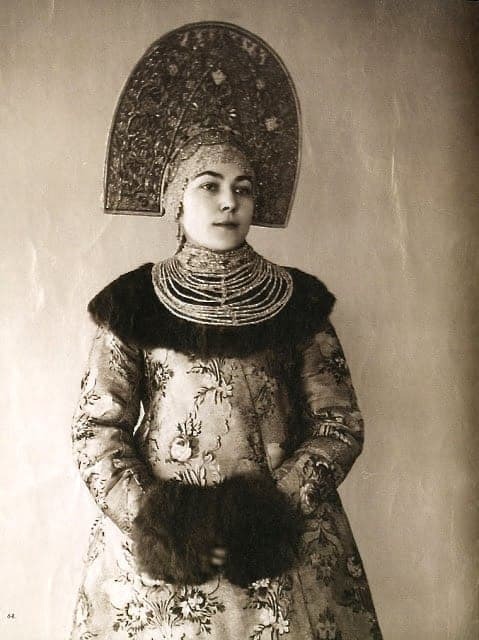 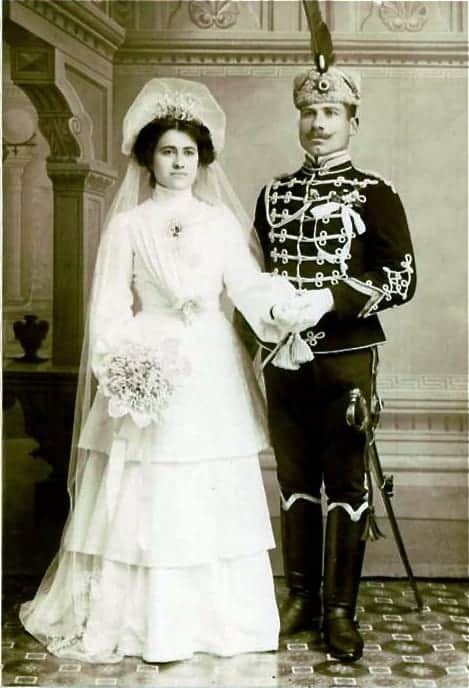 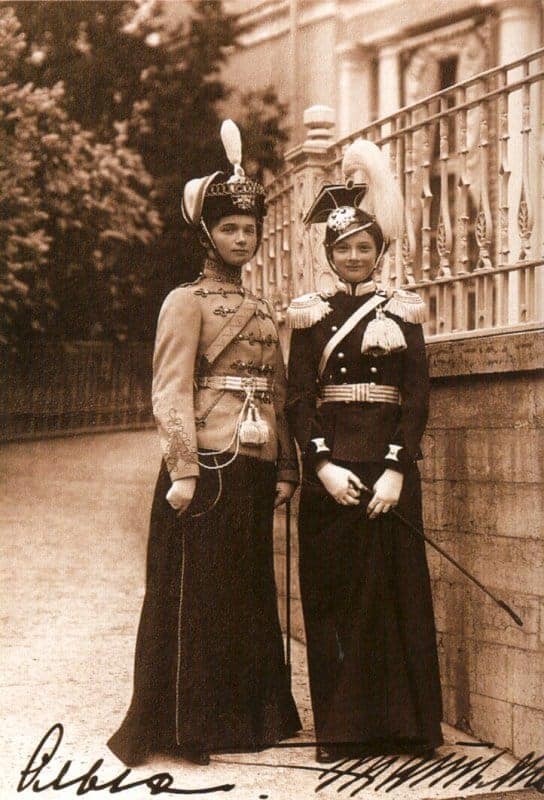 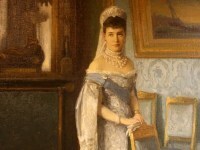 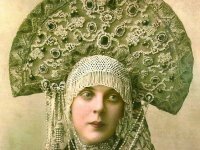 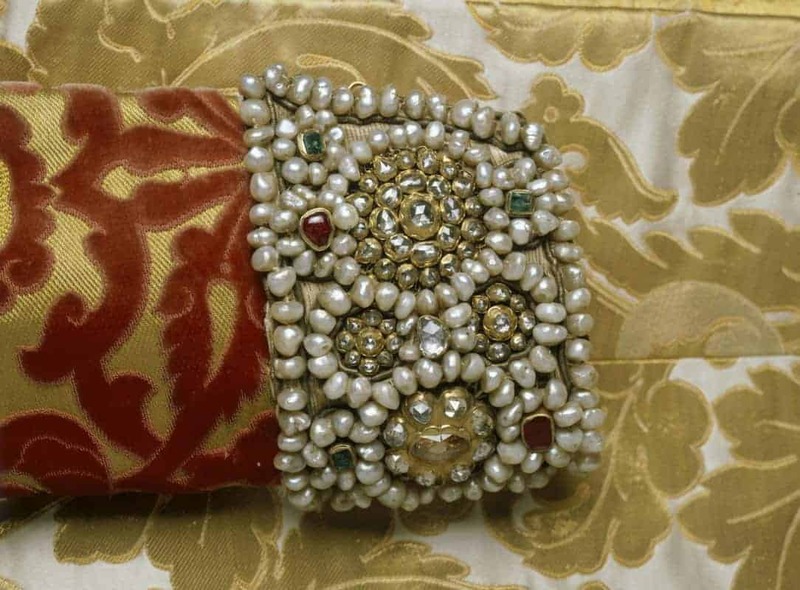 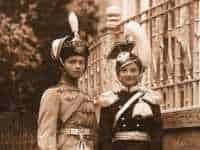 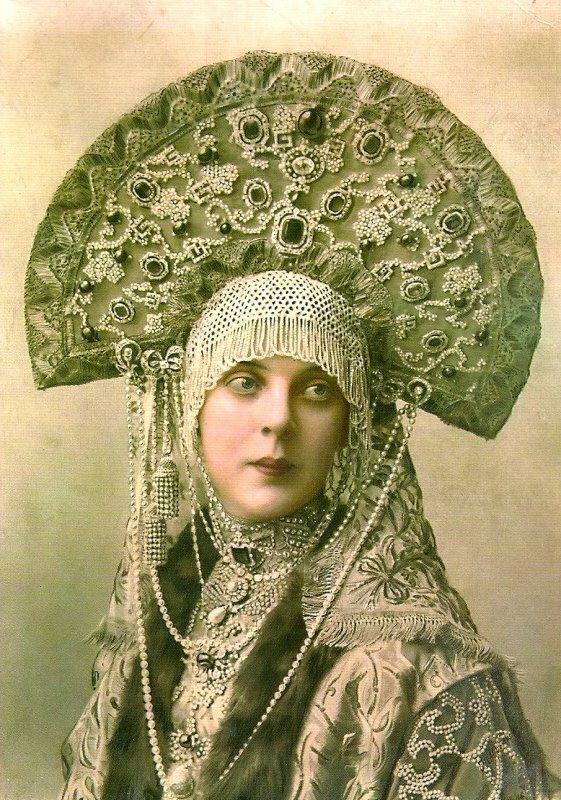 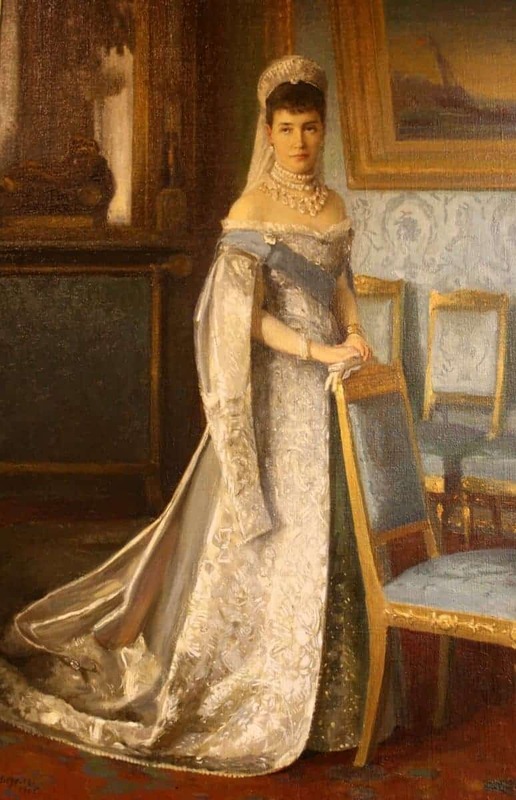 We will look at what was worn by members of the Tsar’s family, courtiers and royal servants, as well as at the extraordinary confections created for balls at the Winter Palace, with headdresses embellished by Fabergé and dresses designed by both Parisian and Russian couturiers. 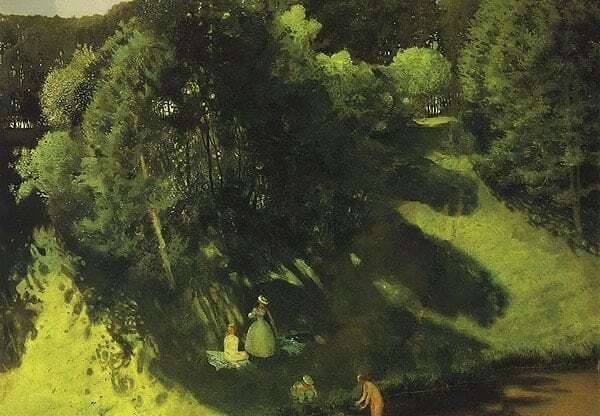 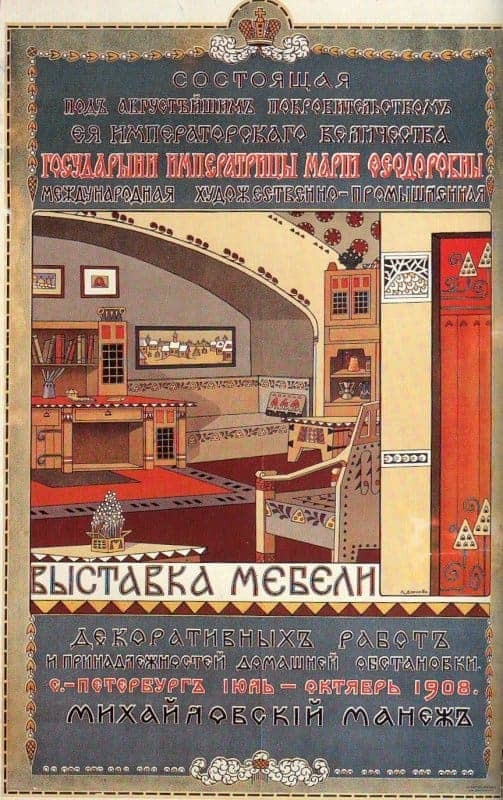 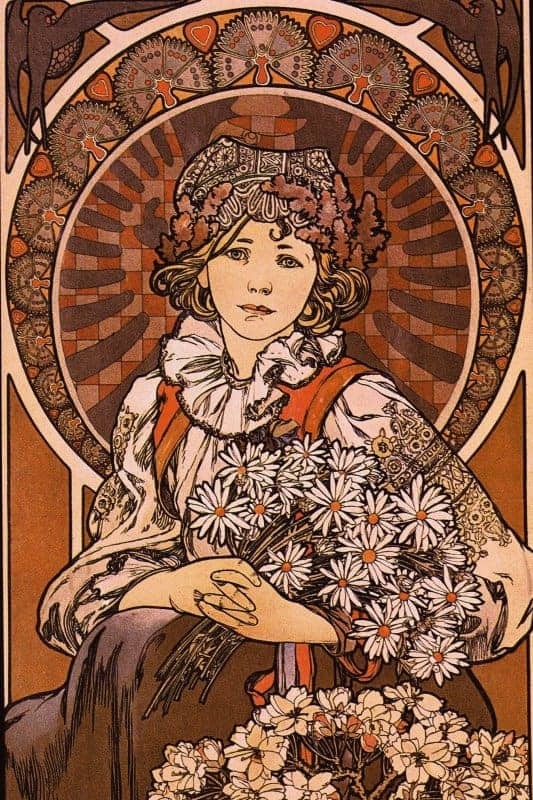 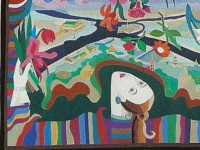 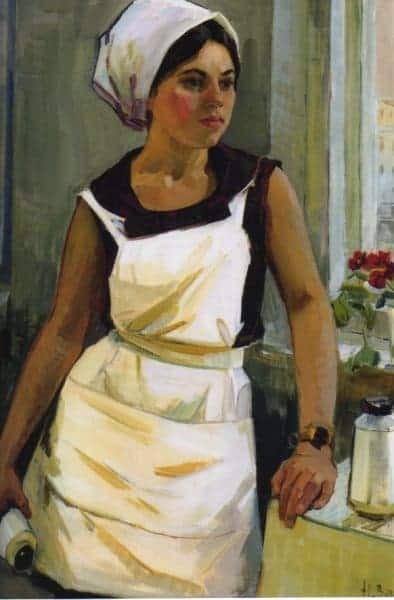 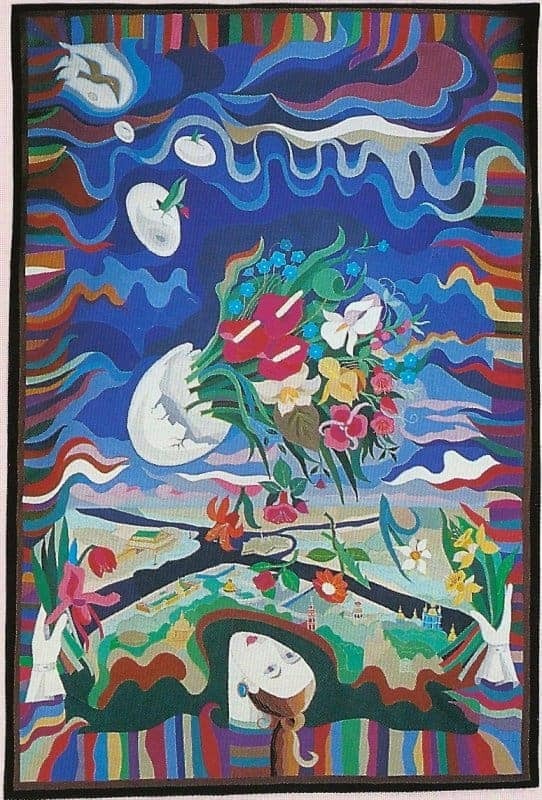 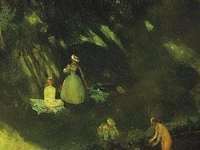 The ‘World of Art’ Movement in Russia – the work of Russian painters, graphic and decorative artists involved in this group at the end of the 19th century, and their connection with British artists, particularly illustrators such as Walter Crane and Aubrey Beardsley. 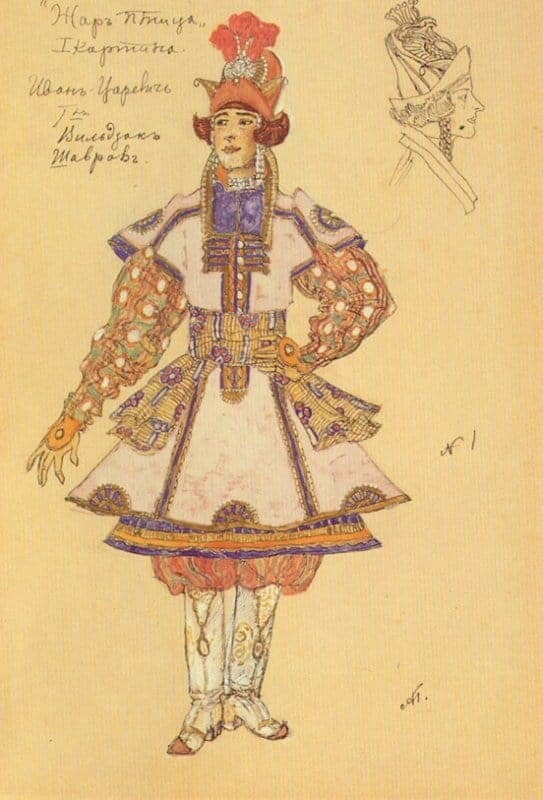 A founder of the Movement was the impresario Sergei Diaghilev, so we will also look at the influence on art and design of his company, the Ballets Russes.